Orphan Train is a fine read for a reader. This book is quick and familiar and stylistically paced with alternating voices and timelines. Although the story is weighted with teen angst and historical misfortune, it’s an easy read. Orphan Train is a challenging read for a writer. Bringing a writer’s critical eye to the novel, the Writers as Readers group was able to discuss at length what worked, what didn’t, and why. We opened our WaR meeting with a brief overview of Tropes. A trope is a tool of storytelling. And there’re a million of them. It’s when a trope becomes too familiar, overused and/or abused that it becomes a problem—a cliché. This book is chock full of cliché. The characters, the plotline, even the title are overly familiar. The author did nothing to step up her characters, dig deeper in to their story, or make her novel unique. 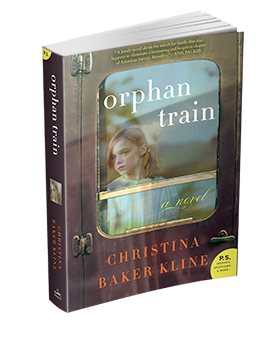 Orphan Train has two protagonists, a teenage foster kid, Molly, and a 91 year old wealthy recluse, Vivian. Their lives conjoin in the contemporary storyline while Vivian’s tragic youth is woven throughout. The current (2011) storyline is told in third person from Molly’s point of view. Molly, a rebellious not-quite-orphan is given the choice of fifty hours of community service or juvie after she commits a crime. Through the help of her boyfriend, Jack, she is able to complete her hours cleaning the attic of Jack’s mother’s employer, Vivian. She and Vivian go through sixty plus years of accumulated possessions. The opening of the boxes brings forth long lost memories of Vivian’s. Her recollections are told in first person as she’s experiencing them (1929-1943). There was some confusion, however, as we were unsure if these reflections were in Vivian’s head or if she was telling them to Molly. There’s a lot of “telling” in this book. WaR were confused as to the genre of the Orphan Train. The jacket says Literary Fiction, and those that read it as Lit Fic read it differently than the readers who assumed it was young adult. It’s not really YA, but we tended to cut the author some slack with that assumption. (Not that we believe YA should be less developed or under produced than other categories.) Some thought it was Historical Fiction. The travails of an Irish immigrant family in the late 1920’s were informational. The brief section about the orphan train inspired many of us to research further on our own. Also interesting was Molly’s Native American heritage. The “portaging” assignment should have been a wonderful vehicle for connecting the lives and loss of these two women, but it, too, merely scratched the surface. Molly’s transformation from the beginning of the book to the end is superficial. She stops coloring her hair and removes her piercings but she doesn’t really change. Vivian’s transformation is even lamer. Hey, look, the old lady can order from Talbot’s online with a credit card! The outline of the story is there; unfortunately the author missed many an opportunity to make it real for these readers. It was suggested that focusing on Vivian’s story alone would have been a deeper read. Or to forgo the time shifts and allow the relationship between Molly and Vivian to emerge through shared experiences. There were many inconsistencies that not only tossed our readers out of scene, but made other parts of the story hard to swallow. Early on in Vivian’s tale, there is a fire that changes her life. But the fire is offered only as a way to make her an orphan and the logistics of the event don’t make sense. The love story was convenient, the loss predictable, and we found the final “big reveal” unbelievable. Then the book ended– all smiles and sunshine (that you can see through ever-opening drapes). Great for a “beach read” but unsatisfying for a Writer as a Reader. The next WaR meeting will be May 5, 2015, 6:30 pm, at Barnes & Noble. The book selection is, All the Light We Cannot See by Anthony Doerr.